Date Added: Friday 16 December, 2016 by Kenneth D.
Just received my Deckard jacket trousers and l must say--fantastic! The workmanship is second to none, with all the details you would see in a well-made suit, right down to the friction ribbon in the pant hem. My boss owns a high-end menswear store and he could not stop admiring the quality, and he is as about as picky as they come. l will definitely be saving my pennies to buy even more of Magnoli's superb products!.. I just received Deckard Jacket . All I can say is stunning! The color to my eye is an exact match to the jacket on screen. The detail is superb. 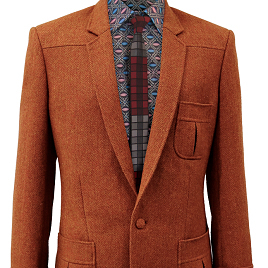 The jacket has such classic looks that it will be a hit at the office or a dinner party. I got compliments right out of the box. I was a bit hesitant to order custom tailored clothing online, but the Deckard Jacket fit perfectly! Thanks so much for your hard work. I'll be ordering from you again soon!.. Date Added: Thursday 08 October, 2009 by Andrea D.
If you wear this jacket, you'll feel yourself as a perfect Blade Runner, ready to the perform the Voight-Kampff test.. oh, actually is a wonderful jacket for the city too!..